When the topic of 1990s Japanese performance cars comes up, we as car enthusiasts tend to beat the proverbial dead horse. We rattle off the Toyota Supra Twin Turbo, Mitsubishi 3000GT VR-4, Mazda RX-7, and the Nissan 300ZX Twin Turbo. We stake out our brand allegiances, javelin the performance specs, and take magazine shootouts as God’s word. We are so very passionate about these vehicles because they represent our realistic dream cars. They are the idols we can actually strive to obtain. The early ‘90s played host to a whole slew of high performance sports cars that were developed during Japan’s vibrant economic bubble—a bubble that would ultimately burst a few years before many of these cars were released. The enormous amount of development resources that the Japanese auto manufacturers invested during this economic period can be seen by the technology present in these automotive offerings. Twin turbocharging, active aerodynamics, four-wheel steering, and electronically adjustable suspension; you name it, they had it. Today, the steadfast cult following of these iconic vehicles has meant that prices have remained relatively strong. Just take a look at the price of any clean Toyota Supra. However, a few models still have an approachable buy-in price for the budget-minded buyer. Enter the complex and gorgeous, venomously fast Nissan 300ZX Twin Turbo. 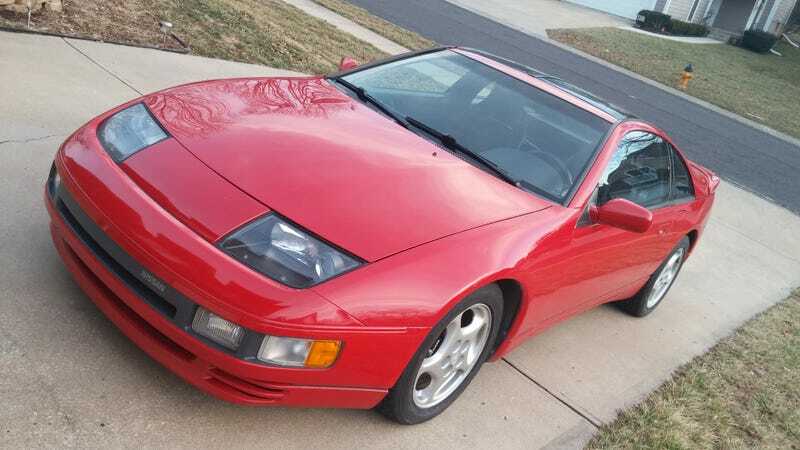 I have always been fond of the Nissan 300ZX (Z32) design. Low-slung, wide and adorned with headlights that even Lamborghini couldn’t say no to. Blessed with 300 horsepower from the factory when the twin-turbo engine and manual transmission were checked on the options list, the car can still put modern sports car offerings to shame. Many of these cars, however, have not lived easy lives. If the body kits, Altezza lights and chrome wheels of the early 2000s haven’t claimed them yet, then the lack of routine maintenance certainly has. These automobiles do not fall into the reliable, happy-go-lucky category of Japanese cars you know so well. The timing belt, for example, needs to be changed every 60,000 miles or four years, whichever comes first. Let this slip and you’ll be shopping around for a new engine. Neglect is not something these cars will put up with. Advertised for $3,800, it was a one-owner car that had sat dormant for a long time in the seller’s garage. It was a twin turbo with a 5 speed and it had a whole host of tasteful performance upgrades. The engine had been replaced with a factory new, Nissan dealer-installed engine less than 40,000 miles ago. The original engine was subjected to an all-too-common-but-fatal hydrolock situation. This occurs when the car is driven through an ocean-like foot of standing water following a rain storm. The intake is mounted so low that the engine just vacuums up all the water, which results in a bad day. To sweeten the deal, the car came with two thick manila folders stuffed full of service records dating back to the day it was purchased new. But there was a catch, as there always is with these cars. You may have heard that the Nissan 300ZX has an incredibly cramped engine bay. I can confirm that it does. In fact, pictures don’t do it justice. When you open the hood on one of these cars, you begin to wonder how in the hell it was ever assembled at the factory. There is absolutely no room to work. If you need to replace the turbos on one of these, the easiest thing to do is pull the engine out of the car. No joking here, it makes life far simpler. The first step was identifying which kind of turbos were installed so that I could source direct replacements. It turns out they were a “hybrid” style based on the stock turbo housings, which employ slightly larger compressor and turbine wheels. After going back-and-forth with a few turbo vendors, I finally found that my best option was to have the turbos rebuilt. With brand new Garrett CHRAs (the heart of the turbo), 360 degree bearings, and new compressor and turbine wheels, I now had better-than-new “hybrid” style turbos that were rated for higher output than the stock turbos. From the very beginning I knew that there were two fuel injectors that had gone bad. Who’s to say the other four wouldn’t soon follow suit? However, the injectors were just tip of the fuel system iceberg. Every part of the 300ZX fuel system is known to start going out when they reach the age and mileage of my car. In the end, I replaced nearly the whole fuel system to simply avoid being stranded on the road side. This is something I never even dreamed of getting into when buying the car, but as it turns out, the idle control system on these things is quite complex and almost always in a state of disrepair. You can spend hours attempting to diagnose the peculiarities with the system only to come to the conclusion that half the parts are not working correctly and that individual pieces cannot be bought and replaced independently. If you are experiencing idling issues, your best course of action is to just replace all components and start fresh. Cheap? No. So keep that in mind when buying one of these cars. This is because there is supposed to be an air deflector in front of the air filter elements to buffer airflow going to the mass air flow sensor. If the mass air flow sensor is subjected to ambient turbulent air, then it gets a false reading which results in the engine wanting to die. This deflector had been removed at some point in the car’s life, so I opted to reinstall a new one. After installing this piece, the engine dying issue became a thing of the past. Yes, those are large chunks of metal. Where did they come from? Well, eventually I found out that they were the teeth from a gear’s synchronizer. Failed synchronizers are an Achilles heel for 300ZX transmissions so this sort of find wasn’t out of the ordinary. Immediately after finding this, I put out a few wanted ads for a known-good five-speed transmission. Kansas (where I live) can be a desolate area when trying to track down parts for a somewhat obscure vehicle. A month passed by and I still didn’t have any good leads on a new transmission. Then, out of the blue on Wednesday afternoon, I received a text from a local gentleman who had seen my Craigslist ad and happened to have a rebuilt five-speed transmission that had been sitting in his garage for more than 15 years. However, there was a catch. It was from a non-turbo 300ZX. The non-turbo and twin turbo five-speed transmissions are the same in every way except for the starter mounting plate on the bell housing. I figured if I could just swap the bell housing from my bad twin turbo transmission onto this refreshed non-turbo transmission, I would be back in business. The 300ZX Twin Turbo has a complicated steering system even by today’s standards. Four wheel steering sounds like a great idea until the realization of its complexity truly hits home. While later 300ZX models employed a hybrid hydraulic and electric steering system, the early models, such as this 1990, used a fully hydraulic system. This means that the front and rear wheels each had their own hydraulically assisted steering racks, and to power these racks was a dual-vane power steering pump which is basically two pumps in one. Many feet of high pressure and low pressure hydraulic hoses complete this techno-marvel package. As with any aging hydraulic system, leaks begin to develop. One of the hardest things to track down is a power steering leak in cramped engine bay like in a 300ZX Twin Turbo. You cannot even see the steering pump, let alone most of the high pressure hoses, without serious disassembly. This car’s system was obviously leaking, with the telltale signs of fluid puddles under the car, an undercarriage covered in fluid grime and the HICAS light being illuminated on the dash. It was time to embark on a complete system overhaul. On my brief journey driving the car home from the seller’s house, I noticed the peculiarly sweet scent of antifreeze in the cabin. Having driven other vehicles that exhibited such an odor, I developed an initial diagnosis that the car’s heater core was nearing its expiration date. The heater core is a small radiator, usually hidden from view behind the dashboard, where hot coolant from the engine passes through. A small electric fan blows air through this hot radiator, and the resulting warm airflow comes out the vents throughout the cabin. Thus, you get warm air when the heater is on. When you start to smell engine coolant in the car, this typically means the heater core has sprung leak. As I mentioned in the heater core section, I had to open up the A/C system. For those unfamiliar with automotive A/C systems (or any A/C system, really), “opening up” means disconnecting the metal hard lines that contain the gas refrigerant that the A/C system uses. You cannot simply open these lines and release the gas into the atmosphere, as knowingly doing this is illegal for environmental reasons, which is why I had to take it to a mechanic shop to legally “evacuate” the refrigerant gas out of the system. The Nissan Skyline GT-R (R32) brake calipers were looking worse for wear because the paint had mostly chipped off. They were mechanically in great shape so I decided to do a quick repaint with high-temp black paint to shine them up. Up until this point, I had never driven a 300ZX Twin Turbo. Well, I had never driven a working one. I had gotten behind the wheel of a non-turbo version a few years ago and I felt that it was quick, but not exactly fast. Needless to say, it was difficult to hold back my excitement to try this car out. Anyone who has done a somewhat involved disassembly and reassembly of a vehicle knows the importance of performing a shakedown before testing out what a machine can really do. I drove the car around for an easy 300 miles – it felt like an eternity, but it was necessary. Once satisfied that everything was working as intended, I opened her up. It was genuinely fast. It was turbo-car fast. The kind of fast that doesn’t hint at itself until midway through the revs, then BOOM, the turbos spool up and it slams you into the back of your seat with no signs of letting up. The whole car comes alive. The sound of the turbos, exhaust and intake fill your ears with a blissful mechanical noise. Before your senses have a chance to take it all in, you’re already finding the next gear, the blow-off valves chirp, and you’re right back into the power band. I never thought I’d own a car that made so many wonderful sounds and had the power to back them up. Like in the beginning of this project, disbelief was beginning to merge with reality, but this time, the feeling was different.